A condominium complex in Delaware County is on fire this evening. 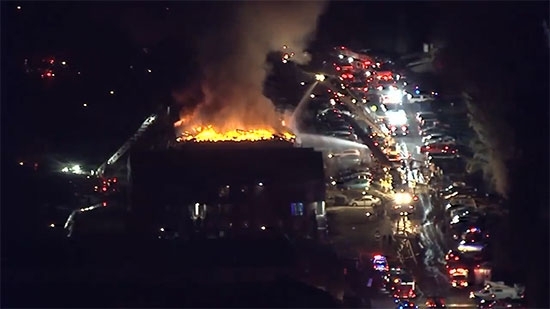 Fire erupted at the Hilltop Condominiums on the 5200 block of Hilltop Drive in Brookhaven around 6 p.m. Heavy flames shot from the roof of the three-story building. Residents were evacuated, but some may have been trapped on the upper floors. The Red Cross is responding to help the evacuees on this frigid night. UPDATE: All 18 units of Building C were occupied at the time of the fire but everyone escaped and is accounted for. One family of three had to be rescued by ladder. There were no reports of injuries. Investigators are working to determine the caused of the blaze. A robbery suspect was shot and critically injured by a plainclothes officer in West Philadelphia this morning following a pursuit. The crime spree allegedly started early Tuesday morning. The armed suspect stole the SUV of a woman on the 5200 block of Church Road. It happened around the 3 a.m. as she was unloading Christmas presents. Later that morning, the armed suspect held up someone inside Kim's Deli at 52nd and Irving. Police responded and found the stolen SUV parked near 52nd and Hazel streets. They waited until a man got in and drove away. Plainclothes officers pursued the vehicle until it crashed at 49th and Walnut streets. The officer identified himself and gave commands but the suspect wouldn't comply. Police say the suspect reached for his waistband and the officer opened fire. The suspect was hit in the chest. He was rushed to Penn Presbyterian in critical condition.